From what I heard, there were several reasons for Opportunity for Olympia coming to Olympia. The income tax to pay for the first year of college for Olympia high school graduates was run here because Olympia was particularly fertile ground. We had supported the last statewide attempt at an income-like tax and we have a good track record of supporting school levies. But, in the wash, Initiative 1 ran far worse in Olympia than either 1098 (47 percent to 56 percent) or local school levies (over 75 percent last time around). So, first let's take a look at how Initiative 1 ran against our 1098 results precinct by precinct. The lighter the placemark, the worse Initiative 1 did against 1098. In a few places (farish westside and far Eastside) Initiative 1 actually did better than 1098. But, the losses in the close in neighborhoods and Southeast Olympia were too much to overcome. Let's take a close look, though, at the precincts where Initiative 1 did better. These aren't usually precincts I play close attention to when I think about Olympia politics. They seem to be areas around the malls and hospitals. A few precincts around the South Sound Center St. Petes and then up Lilly Road supported the local income tax over the statewide one, as well as precincts around the Capital Mall and Capital Medical Center. I have no idea what this means. Again, the lighter the placemark, the worse Initiative 1 did against the last levy in February 2016. But, again, there were no precincts where the initiative did better than the levy. We can't see a repeat of the South Sound Mall/St. 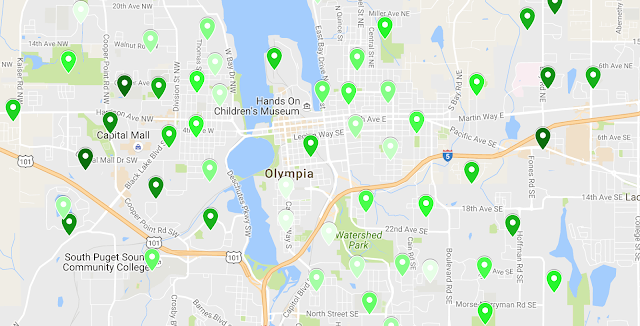 Pete's precincts, since they're inside the North Thurston school district. But we can see some dark spots in the westside near Capital Mall/Medical center. And, again the South Capitol to SE Olympia axis, Initiative 1 did far worse. Most interesting is that there are a few well off westside, water view precincts on the westside where the levy (property tax) did worse than generally than the initiative (property tax). My guess, people with lower incomes but better home values (water view westside) like Initiative 1 better than people with lower home values and higher incomes in the deep SE side. Just a wild guess based on neighborhood stereotypes. There are a lot of apartment buildings in the areas where prop 1 did well. If you run them against demographics, I'll bet you'll find a higher than usual number of college-age voters.